Best 2012 album worth the half a decade wait was Aesop Rock's pitch perfect Skelethon on Rhymesayers - which diehard fans patiently waited five years for and were most happy with the results. The album did (and needed to) include lyric sheets to help decipher Aesop Rock's ever intricate lyrics on songs like "Zero Dark Thirty." 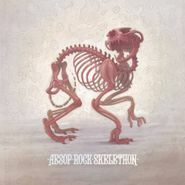 First El-P comes back with the awesome Cancer 4 Cure and now Aesop Rock is back with his first album in five years, Skelethon. First single “Zero Dark Thirty” sees Rock rapping more head-scrambling rhymes, but they’re far from inscrutable, and their backdrop of blinking synths and tinny beats seems positioned to catch attention as he slowly rolls over the word “ri-god-dam-diculous” before launching into the song’s chant of "down from a huntable surplus to one." His songs continue to be thoroughly addictive, inviting listeners to track back through the vocal hurricanes he unleashes in songs like “ZZZ Top,” which recalls old-school hip-hop in cadence but sounds nothing if not futuristic in its imitable absurdist wordplay. On Skelethon Aesop Rock shows he hasn’t softened at all over the years — he’s as wildly inventive as ever.